He sure knows how to pose for the camera! 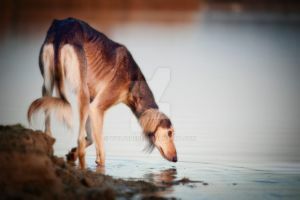 Salukis are incredibly beautiful dogs! such a gorgeous dog!! I love the fur between his toes, so cute! I love him!! I want soooo bad!! Wow, he's a stunning fellow! I love grizzle Salukis. ohooo älskar den där rasen, dem är så himla söta, Borzoi också! !